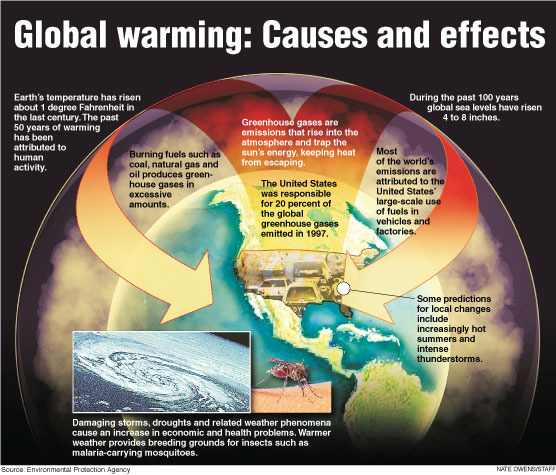 Global Warming refers to a weather phenomenon which effects average increase of global temperatures since the mid-twentieth century. It is generally agreed that global warming is the result of "green house gases" which have collected in the lower levels of our earth's atmosphere. Basically, the process begins with the consistent increase of deposit of Green House Gasses. Green house gases are gases such as water vapors, carbon dioxide, methane, nitrous oxide, ozone and other mixed compounds. These are all scientifically known to be harmful to the repertory system of animals and humans alike. In the earth's atmosphere, these pollutants act as a blanket which absorb and produce radiation. increases in anthropogenic greenhouse gas concentrations is very likely to have caused most of the increases in global average temperatures since the mid-20th century." There are many things to consider when addressing the Facts of Global Warming. For instance, the degree to which green house gas emissions cause the overall reason for global warming, is still a matter of debate. Granted, there might be other factors to take into account. For example, it is indeed natural for the earth to experience certain patterns and trends in climate change. History shows that there have been times when extreme temperature highs and lows occurred long before green house gas emissions. However, as technology and modernization quickly developed, so too did our carbon footprint. At this point there is enough collected and analyzed data to suggest that there is a significant difference between Global Warming and Climate Change and that the causes of these unusual weather phenomena are far from just natural. burning of fossil fuels and deforestation leading to higher carbon dioxide concentrations. Land use change (mainly deforestation in the tropics) account for up to one third of total anthropogenic CO2 emissions. livestock enteric fermentation and manure management, paddy rice farming, land use and wetland changes, pipeline losses, and covered vented landfill emissions leading to higher methane atmospheric concentrations. Many of the newer style fully vented septic systems that enhance and target the fermentation process also are sources of atmospheric methane. Other associated changes might vary based on region, the atmospheric lifetime and Global warming potential (GWP). Global warming is expected to continue beyond 2100, even if and when emissions stop. This is because of the large heat capacity of the oceans and the long lifetime of carbon dioxide in the atmosphere. Indeed global warming is a complex issue.